Cumulatively, we estimate it saves over 200 years of typing time per day. Yes, per day! You’ll notice we call these autocomplete “predictions” rather than “suggestions,” and there’s a good reason for that. Autocomplete is designed to help people complete a search they were intending to do, not to suggest new types of searches to be performed. These are our best predictions of the query you were likely to continue entering. How do we determine these predictions? 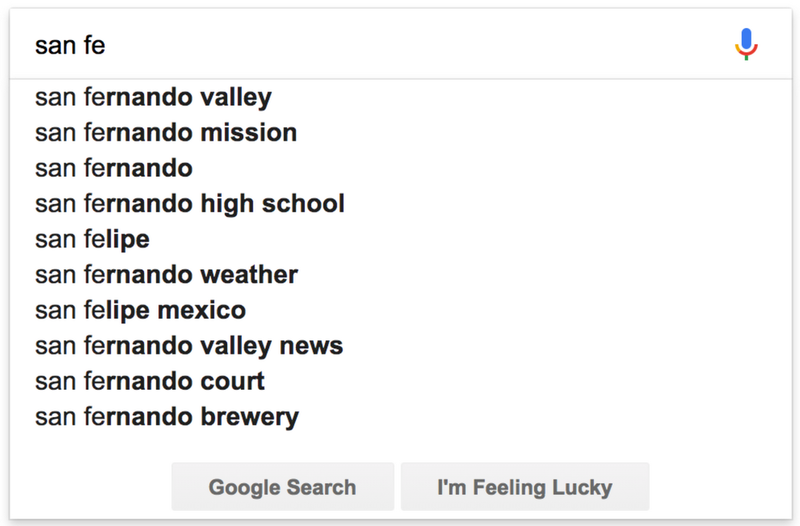 We look at the real searches that happen on Google and show common and trending ones relevant to the characters that are entered and also related to your location and previous searches. That makes sense. 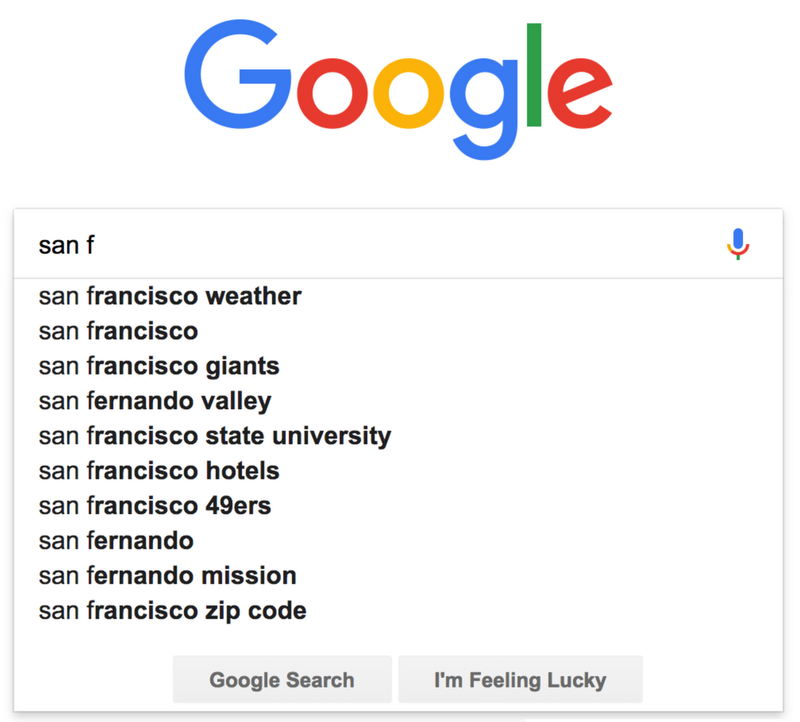 It becomes clear from the additional letter that someone isn’t doing a search that would relate to San Francisco, so the predictions change to something more relevant. In addition to these policies, we may remove predictions that we determine to be spam, that are closely associated with piracy, or in response to valid legal requests. A guiding principle here is that autocomplete should not shock users with unexpected or unwanted predictions. This principle and our autocomplete policies are also why popular searches as measured in our Google Trends tool might not appear as predictions within autocomplete. Google Trends is designed as a way for anyone to deliberately research the popularity of search topics over time. Autocomplete removal policies are not used for Google Trends. We have systems in place designed to automatically catch inappropriate predictions and not show them. However, we process billions of searches per day, which in turn means we show many billions of predictions each day. Our systems aren’t perfect, and inappropriate predictions can get through. When we’re alerted to these, we strive to quickly remove them. 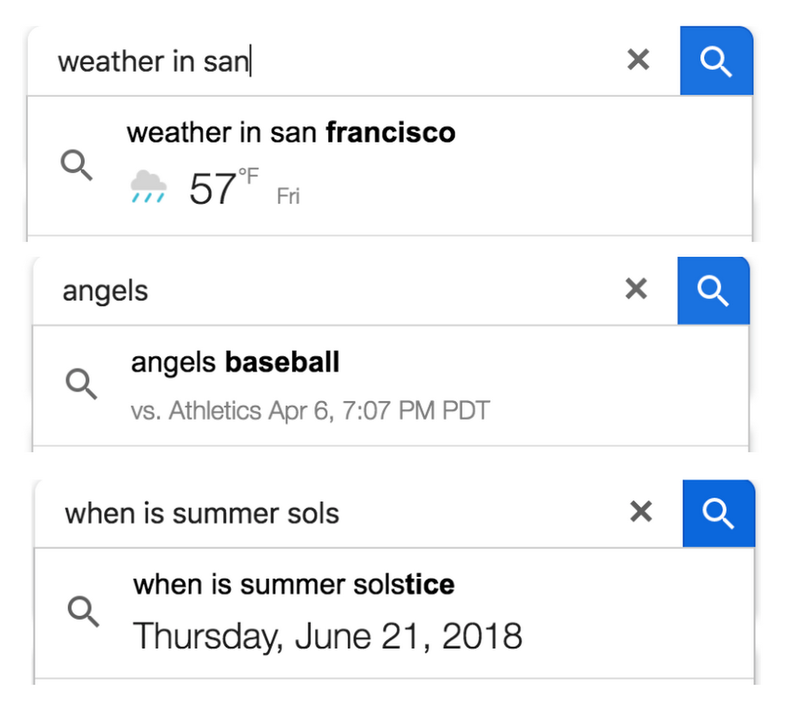 It’s worth noting that while some predictions may seem odd, shocking or cause a “Who would search for that!” reaction, looking at the actual search results they generate sometimes provides needed context. 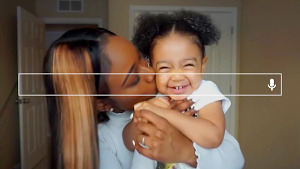 As we explained earlier this year, the search results themselves may make it clearer in some cases that predictions don’t necessarily reflect awful opinions that some may hold but instead may come from those seeking specific content that’s not problematic. It’s also important to note that predictions aren’t search results and don’t limit what you can search for. Regardless, even if the context behind a prediction is good, even if a prediction is infrequent, it’s still an issue if the prediction is inappropriate. It’s our job to reduce these as much as possible. To better deal with inappropriate predictions, we launched a feedback tool last year and have been using the data since to make improvements to our systems. In the coming weeks, expanded criteria applying to hate and violence will be in force for policy removals. Our existing policy protecting groups and individuals against hateful predictions only covers cases involving race, ethnic origin, religion, disability, gender, age, nationality, veteran status, sexual orientation or gender identity. Our expanded policy for search will cover any case where predictions are reasonably perceived as hateful or prejudiced toward individuals and groups, without particular demographics. With the greater protections for individuals and groups, there may be exceptions where compelling public interest allows for a prediction to be retained. With groups, predictions might also be retained if there’s clear “attribution of source” indicated. For example, predictions for song lyrics or book titles that might be sensitive may appear, but only when combined with words like “lyrics” or “book” or other cues that indicate a specific work is being sought. As for violence, our policy will expand to cover removal of predictions which seem to advocate, glorify or trivialize violence and atrocities, or which disparage victims. Our expanded policies will roll out in the coming weeks. We hope that the new policies, along with other efforts with our systems, will improve autocomplete overall. But with billions of predictions happening each day, we know that we won’t catch everything that’s inappropriate. 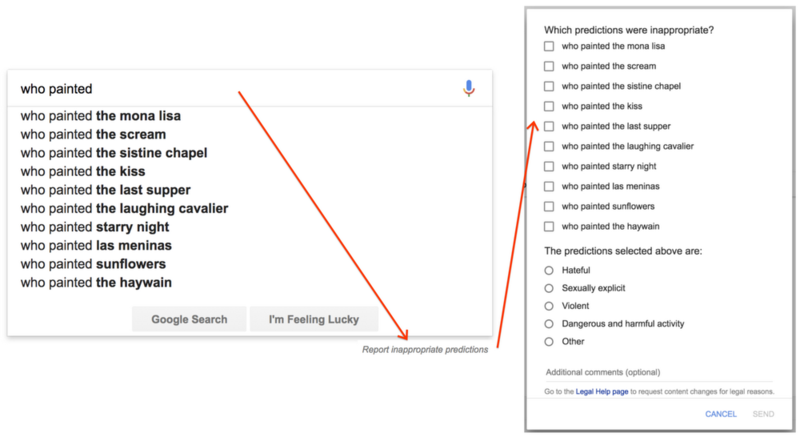 For those on mobile or using the Google app for Android, long press on a prediction to get a reporting option. Those using the Google app on iOS can swipe to the left to get the reporting option. By the way, if we take action on a reported prediction that violates our policies, we don’t just remove that particular prediction. We expand to ensure we’re also dealing with closely related predictions. Doing this work means sometimes an inappropriate prediction might not immediately disappear, but spending a little extra time means we can provide a broader solution. As said above, our predictions show in search boxes that range from desktop to mobile to within our Google app. The appearance, order and some of the predictions themselves can vary along with this. When you’re using Google on desktop, you’ll typically see up to 10 predictions. On a mobile device, you’ll typically see up to five, as there’s less screen space. You can tell if a past search is appearing because on desktop, you’ll see the word “Remove” appear next to a prediction. Click on that word if you want to delete the past search. On mobile, you’ll see a clock icon on the left and an X button on the right. Click on the X to delete a past search. In the Google App, you’ll also see a clock icon. To remove a prediction, long press on it in Android or swipe left on iOS to reveal a delete option. You can also delete all your past searches in bulk, or by particular dates or those matching particular terms using My Activity in your Google Account. 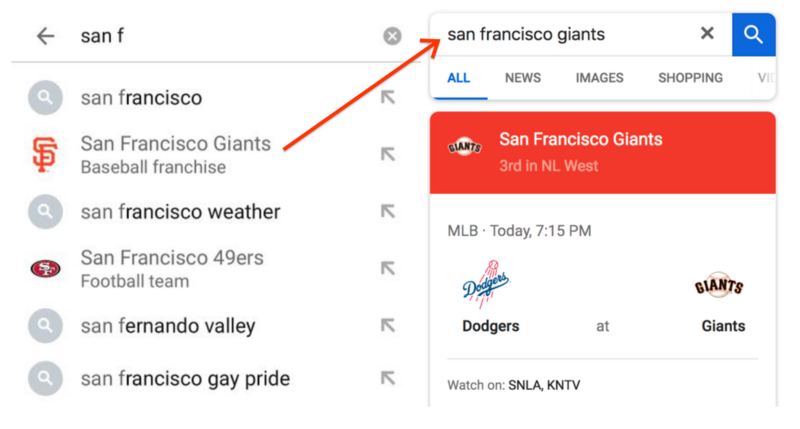 We hope this post has helped you understand more about autocomplete, including how we’re working to reduce inappropriate predictions and to increase the usefulness of the feature. For more, you can also see our help page about autocomplete. You can also check out the recent Wired video interview below, where our our vice president of search Ben Gomes and the product manager of autocomplete Chris Haire answer questions about autocomplete that came from…autocomplete!